“Lightning deal” sales and strong red wine are a deadly combination, especially when I have prospective Xmas money burning a hole in my pocket… last year I impulse-bought the Borgias boxset, and this year it was the complete Larry Sanders Show! Much like Seinfeld, this was a critically-acclaimed, award-winning American import that the BBC chose to hide away in a graveyard slot, where no one with a normal body-clock would ever discover it. Thankfully I was a student when it was first broadcast, and happy to wait up past my parents’ bedtime to sit watching new episodes with my headphones on! Although Larry’s back-talking assistant ‘Beverly’ (Penny Johnson Jerald) steals several scenes with her sweary admonitions, the female character who scores the most screentime and consideration is Larry’s long-suffering wife ‘Jeannie’, played by Megan Gallagher. Oddly enough, I worked my way through all three seasons of Millennium (1996-99) a few months back, but didn’t recognise her from that, despite the fact that she plays a similar role in both shows… i.e., the initially supportive but increasingly resentful wife of a protagonist whose unusual career constantly overwhelms their life together. The one big difference between them is that I was actively cheering for ‘Catherine Black’ to get killed off, whereas I’m genuinely disappointed to see that Jeannie won’t be returning in the second season of TLSS. Clearly it had nothing to do with Gallagher’s performance, because she totally nailed all of her scenes here, with her witty put-downs, tipsy blurting, and impassioned pleas for sanity… so I can only assume she was written out because the character was simply too likeable and grounded to be in a long-term relationship with Larry, and the show-runners felt she was dragging down the fame-whoring-crazy-quotient. Meanwhile, Shandling’s real-life partner at the time, Linda Doucett, had a recurring role as Hank’s devoted assistant ‘Darlene’, and brought an endearingly sweet/gentle energy to her scenes… so I was saddened to discover that her off-screen experience working on the show was so unpleasant, leading her to eventually file suit for sexual harassment and wrongful termination. As for the supporting cast: Deborah May appeared in ep #1.1 as ‘Melanie Parrish’, a pushy network suit who wanted Larry to participate in live commercials for incongruous gardening products. Dana Delany appeared in ep #1.2 as a guest who was blanked by Larry as soon as the cameras stopped rolling. Harsh! The same episode also featured Cindy Morgan as ‘Karen’, a fun-buddy that Hank was trying to finagle onto as many TV shows as possible, and Sheila Shaw as one of his many female fanclub-members (known as “Kingsley’s Queens”!). 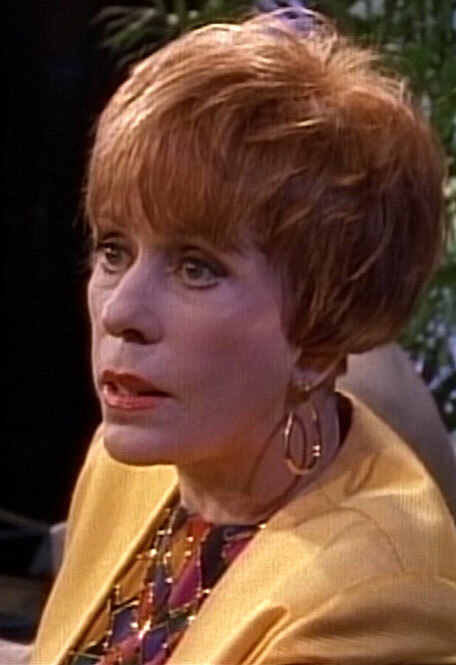 Carol Burnett appeared in ep #1.3 as a guest, unimpressed by Larry’s lacklustre sketch-comedy skills, and leaping on to his back screaming when he accidentally unleashed a cluster of spiders into the studio! 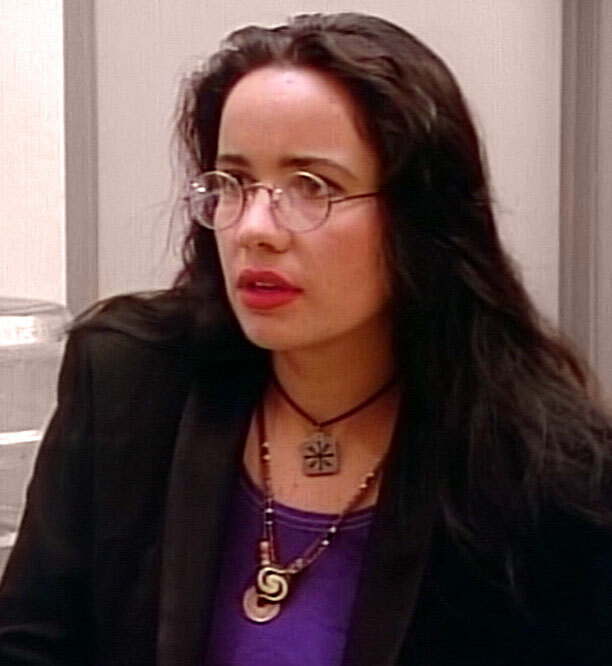 Anne-Marie Johnson appeared in ep #1.4 as ‘Barbara Kirsh’, a network suit concerned that Dana Carvey was using a guest-hosting gig to launch his own talk-show career… and Evelina Fernández (aka Evalina Fernandez) appeared in ep #1.5 as ‘Nina’, Artie’s sympathetic home-care nurse. Mimi Rogers appeared in ep #1.6 as an extremely flirtatious guest, who got Larry so hot-under-the-collar that he broke precedent and invited her back for an encore performance on the following night’s show… much to Jeannie’s displeasure, despite her husband’s (extremely weak) protests of marital fidelity. This episode also saw the first appearance of Mindy Sterling as an unnamed female ‘Writer’, who’s little more than a featured extra (she returned in eps #1.11/13, but never got a name or memorable line of dialogue). Kimberley Kates appeared in ep #1.8 as ‘Sally’, an impetuous staffer who was not-so-secretly schtupping head-writer ‘Jerry’ (Jeremy Piven) in various locations around the studio… including a gantry over the audience during a live-taping! Catherine O’Hara appeared in ep #1.9 as a guest, awkwardly eavesdropping and interrupting a row between Larry and Jeannie. Finally, Suanne Spoke appeared in ep #1.12 as ‘Carol Biederman’, a litigious civilian Larry rudely shoved aside while shopping in a drugstore, in full view of a CCTV camera. Oops! This entry was posted in Rants about TV and tagged Anne-Marie Johnson, Carol Burnett, Catherine O'Hara, Cindy Morgan, Dana Delany, Deborah May, Evalina Fernandez, Evelina Fernández, Janeane Garofalo, Kimberley Kates, Linda Doucett, Megan Gallagher, Millennium, Mimi Rogers, Mindy Sterling, Penny Johnson Jerald, Sheila Shaw, Suanne Spoke, The Larry Sanders Show. Bookmark the permalink.